How-To: Make Long-Distance Friendships Work. | The girl who loved to write about life. When I was 14, we moved from Tennessee to Florida. In Florida, I was always the youngest of all my friends, so I had to stay behind when they went off to college. I moved to Lakeland, back to Melbourne Beach, and then to Orlando. Point being, I've got friends and family spread out over quite a few places. As someone who's best friends are located in different towns, I've learned a few things about making friendships work no matter how far apart you live. 1. Make an effort to stay in touch, even if you feel like it's one-sided. For awhile, it will be. House hunting and job searching and settling in can be a lot to juggle. I went from graduation straight into wedding planning. I would go days without even looking through my texts. But when I did, it was like a virtual hug to see that my friends hadn't stopped texting me just because I moved away. Just because they can't answer every call doesn't mean you should stop calling. Just because they can't text back every time doesn't mean you should stop sending them hilarious memes. Keep 'em going. 2. Don't expect them to call you every single time they're in town. This is especially true if you live in the same town as their family. When you announce you're coming back to town, everyone expects to spend a lot of time with you, your family being at the top of that list. So don't be upset when you find out they were in town...they may have needed to jet in and spend a few days with family, or they may have had an emergency at home. Either way, if they don't tell you they're in town, it's for a reason. Nothing makes my day like getting a letter. So go to the dollar section at Target, grab some pretty paper, and write a quick "thinking of you" down. It takes such little effort, but can totally make someone's entire week. 4. Realize that they have a new life now. So ask about it! Don't only talk about what's going on in your life and the town that they left. Let them talk about their new life and new friends without feeling guilty. The best kind of friends want their friends to have other friends wherever they are. When I moved to Orlando, my best friends from college always made sure to ask if I was making any friends. They encouraged me to get out of my comfort zone to meet people, and that made me feel stable in a time of transition. FaceTime is a beautiful thing. "What are you doing right now? Having ice cream? Cool, me too. Let's FaceTime and eat ice cream together." FaceTime has totally revolutionized long-distance friendships because you can do it from anywhere, and it takes such little effort. 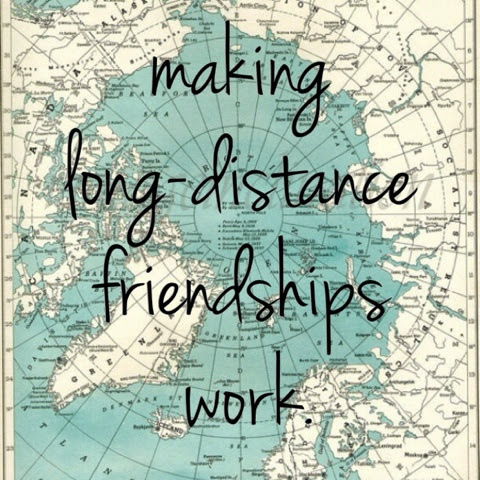 What do you think helps make long-distance friendships work? These are all so true - group messaging is also amazing! I am on a group text with 5 of my gfs in NY and it helps me feel like I'm still there and hanging out! Great tips, girl! I have a TON of long distance friends and you hit the nail on the head with Facetime. It makes it so easy. These are wonderful tips. One of my closest friends whom I have been best friends with since elementary school is moving to Tennessee in a few weeks and I am so sad about her leaving. Of course I a excited for her to have wonderful new experiences and a lovely new life but I am going to miss her so much and am so dedicated to staying in touch. YES, YES, YES! I couldn't agree to these more. My best friend and I started writing letters to each other. We both hate chatting on the phone but the thought of getting a handwritten letter sounds so fun. Plus it's a great excuse to buy cute stationary. I think I'll start doing this with some of my other friends too! I totally agree...Things will change and be different and you can't set expectations. You just allow the friendship to grow into something else. Love this article!!! I definitely need to remember it now that most of my friends have graduated and moved to new cities! These are all great tips. I have many friends who live around the globe...the biggest thing that has worked for us is communication. We plan dates on skype, call one another and of course, use Facebook. It's nice to see pictures of their lives and loves, it feels like I am with them even when I am physically not. I think I shall start writing letters to my best friends who just moved out of state. These are all great tips. I've moved a lot too and never really found a way to stay connected other than the occasional Facebook post. I really need to reach out more to the people I care about. To this day I still LOVE snail mail! Such good tips. I have a ton of long-distance friends also, but I'm not the best at always keeping in touch! I love the writing letters idea. All great ideas. #2 is especially important! I never use #5 but I should. Such a great list! All of it applies to me and is helpful to keep in mind especially high expectations. This is great advice and so true! Especially #2. I used to get mad at one of my friends for not making time for a quick Starbucks get together or lunch, forgetting that he had family here. This really helped me, thank you so much! My best friend is getting married and she has this completely new life now. This just reminded me how little effort it takes to keep in touch and reach out. Love this amazing list! I totally know what this is like! After college I moved to Florida, and then back to my home town, and now I'm in Cali. I've had to learn to maintain those long distance friendships. Great tips! These are great tips. After moving abroad I lost contact to some of my friends. I'm glad there's Facebook though because even if we do not talk often anymore we are still updated at each other's lives through online. This is great advice! I've found that even the smallest of efforts (say a text) really goes a long way in keeping the friendship alive. These are all great tips. My best friend lives in Paris, and we get to see each other once(ish) a year so texting, emails, cards and Facetime is the best way to stay close.